Clyde Taxi Advertising was established in 1999 as a specialist company to supply advertising on London style taxis not only in Scotland but, throughout the UK. Whether you wish to vinyl wrap an entire nationwide taxi fleet, or just have a single branded taxi in the city, Clyde Taxi Advertising has the solution to meet your needs. We effectively work with all kinds of business campaigns from local companies to major blue chip brands. 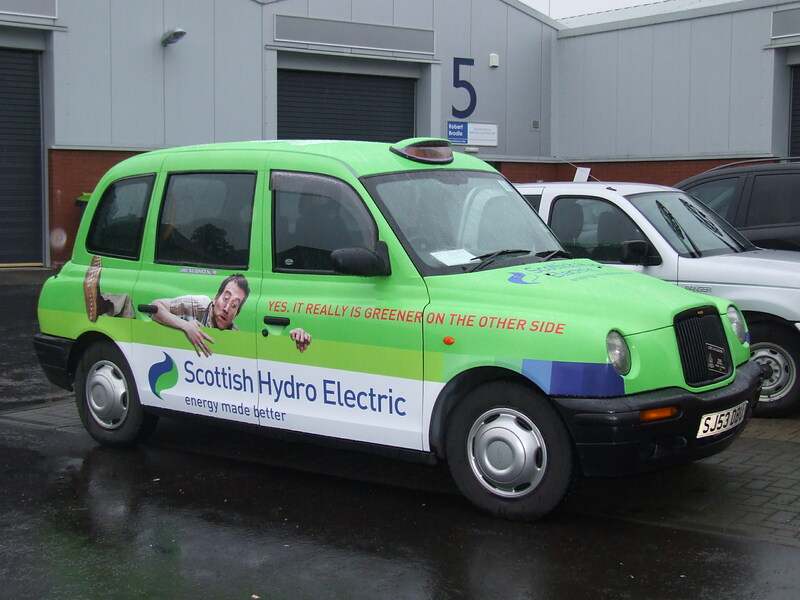 Clyde Taxi Advertising can offer various forms of taxi advertising, from fully covered digitally printed branded wraps, mega-side wraps, super-side panels, tip-up seat advertising, receipt pads to in-car leaflet dispensers. We try to cover every potential so please contact us if you have any other requirements. We supply taxi advertising to most major towns and cities throughout the UK including London, Birmingham, Manchester, Glasgow and Edinburgh to name some. Our sister company, Clyde Wraps (Vehicle Graphics) is a division of Clyde Taxi Advertising and specialise in all aspects of graphics and vinyl wraps for all vehicle types. This includes everything from simple vinyl lettering to a full colour digitally printed wrap. Anything from a single vehicle to an entire fleet can be catered for, from cars, taxis, buses, coaches, vans, pickups to large trucks. Click here to go to the Clyde Wraps (Vehicle Graphics) website.